Finding a Dallas SEO company that can be trusted to produce measurable results is not as easy as it should be. Because Google continues to evolve with each algorithm update, business owners in the Dallas area can have trouble gaining and sustaining search rankings for high volume terms. Hiring the most credible SEO agency in the Dallas Fort Worth Metroplex is the best way allocate your marketing resources. Our team of 20 specialists will perform every task necessary to maximize your ranking position on SERPs. SEO is the process of achieving visibility on Google for relevant search queries. When defined in a local context (Dallas SEO), its application is geo-specific. The goal for Dallas search engine optimization is to establish prominent search rankings for search queries related to the Dallas, TX area. DFW businesses who apply SEO do so with a goal of generating local clicks. SEO cannot be learned overnight nor can it be applied in such a short duration. The process developed at Dallas Fort Worth SEO has taken more than a decade to master. Each week, we refined our process even more to keep pace with Google’s most recent changes. We are one of the few marketing agencies in Dallas that is constantly testing Google’s changes, even ones that go unreported to the public. Below is our detailed guideline for how we optimize Dallas clients and help them dominate local search. Our first step is to design a custom website for your Dallas-area business. Our design team crafts visually appealing websites with custom codebase so that they can be easily crawled by Google while also appealing to consumers and converting them at an exemplary rate. A well-designed site not only looks crisp on the front-end but is clean and easy to parcel on the back-end. DFW SEO’s web developers built websites that are SEO-friendly. With over a decade of experience managing SEO campaigns for clients throughout DFW, we understand what Google looks for in a website both from a visual display point of view, as well as codebase. Do-it-yourself website templates might look nice, but the don’t provide the same SEO potential as custom code does. Most website visitors in 2019 will be accessing a page via mobile device. With this in mind, websites must be fully optimized for mobile display and usability. This can be accomplished through professional web design that focuses on mobile dimensions. Responsive design is typically the best kind of format to utilize since it ensures that your website displays normally on all devices. Speed and navigation are the two greatest considerations for a mobile user. A site that takes more than 3 seconds to load is likely to be exited before the user ever sees the page content. Similarly, a mobile page that discourages simple navigation (i.e. clunky, obtrusive, distorted) is going to be exited at a high rate and thus signal to Google that users are less that enthused about its usability. In an increasingly distracted society, speed matters more than ever for websites. We noted that mobile users will leave websites that don’t load within 3 seconds at a considerably high rate. Even desktop users have an expectation for expedience in today’s internet landscape. After all, everything is available at our fingertips with WiFi connectivity and 24/7 access. Google offers two free tools to test your website’s current site speed. One is PageSpeed Insights which is a broader look at how fast your site will load on any device. The second tool is Test My Mobile Speed which specifically measures how a site loads on a mobile device and even suggests improvements to web developers for increasing their mobile speed. Every successful SEO campaign is driven by keywords. Tools like MOZ, SEMRush & Ubersuggest are used by agencies like ours to identify the highest opportunity keywords in the DFW area. These terms and phrases will vary by industry and niche bu will always have local context. What constitutes opportunity? Where search volume and search competition intersect. The best keywords to target have a relatively high search volume and a relatively low competition level. This means that a considerable number of users are searching for the term but not many websites are explicitly targeting it, or at least doing so successfully. In cases like these, a well-optimized page can rank quickly and pull in a nice share of valuable traffic. DFW SEO has worked with industries of all types and welcomes business owners of any service trade. By providing the full spectrum of internet marketing services,no aspects of your presence is neglected or left unattended to. The result is a robust online standing that helps your business rank toward the top of SERPs for relevant queries, and ultimately generate more leads and revenue. Call 800.231.4871 for Dallas SEO services. The Dallas Fort Worth SEO team includes in-house experts in each of the components listed above. We don’t outsource content or web design to 3rd party companies, but instead handle all of it under a single roof. This way, when customers request changes or explanations, we can provide them with clarity and definition. Sure, we could perform a single task on your company’s behalf, but we’d opt against it for ethical reasons. Providing a service like blog posts only, would only hurt your overall internet presence and limit our ability to improve your standing. Call 800.231.4871 to schedule a free phone consultation with our Dallas SEO company. By signing on with DFW SEO, your progress will be well documented so that you never have to guess how your website is performing. We provide intuitive statistics to help clients accurately gauge our performance along with their own. Some aspects of SEO fall on the shoulders of the client. For example, generating reviews for your business by asking for them from customers is something a marketer cannot do for you. What we can do however, is make it easier for consumers to leave feedback. We follow this very creed through website review integration which prompts website visitors to leave a review via Google or Facebook, directly from your website. This saves many customers the hassle of finding your review page and increases the probability of a documented testimonial. Call 800.231.4871 for SEO for Dallas small businesses. Search Engine Optimization (SEO) is not a singular concept or entity. Instead, SEO involves a wide range of internet marketing tasks and techniques, each of which contribute to a strong web presence. 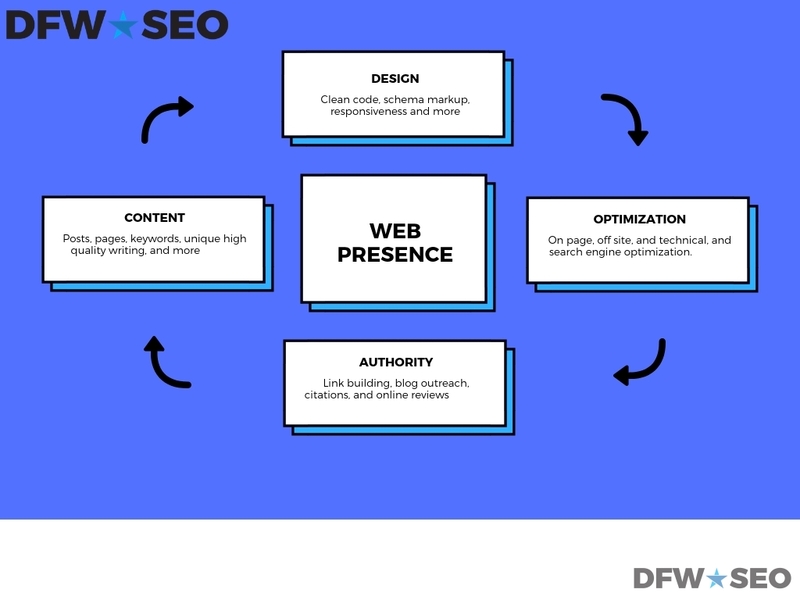 At Dallas Fort Worth SEO, our team is diversely skilled to handle all of these components, in house! We don’t outsource our work, so that we’ll have informed answers for clients and make changes as needed. Join Today! Updated on February 13, 2019 at 9:07 pm by Dallas / Fort Worth SEO.